I got my PhD in this very Physics department, in the early days of pulsed lasers and developing the internet. After a spell travelling, and working for the BBC, I got a lectureship here at Imperial in 1985. Apart from the odd year in California, I’ve been here ever since, becoming a professor in 2000. Much of my research has been with nanostructured semiconductors but along the way I learnt new ways of making and using mid-infrared light, and lately I’ve been exploiting this knowledge for medical applications. Clinical trials with our “Digistain”, mid-IR cancer biopsy imaging instrument have proved it to be very effective in diagnosing Breast Cancer early on and with increased confidence. It is well on the way to commercial exploitation. 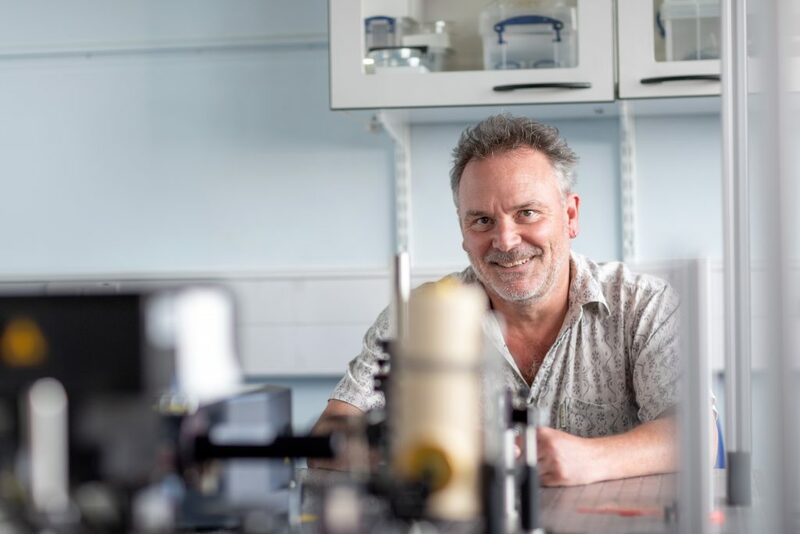 Working at the physics/life science interface also helped me realise how we could adapt some of the nano-imaging methods developed by solid state physicists to make a new microscope that can look inside cells. Now we can see the tiny organelles inside a cell optically for the first time. The spatial resolution, ~8nm, beats the Abbe resolution limit by 1200x and we think it has the potential to augment, or even replace, electron microscopy right across the biosciences. I’ve always loved science, and refused to believe that it should be the preserve of “ivory-tower” types. All through my career I’ve made time for appearances at schools and science shows all over the world. My demo-laden and occasionally hazardous lecturing style has drawn many a comment, and even the odd award! I’ve also made numerous TV, radio and newspaper appearances, and once went live on BBC’s newsnight to explain opto-electronics research to Jeremy Paxman’s multi-million strong audience. It was terrifying, but definitely worth it.